In recent years, there has been a renewed interest in the relationship between the concept of canon and the interpretive task. This discussion typically takes place in the field of Old Testament studies, leaving much of the New Testament terrain untouched. As interpreters have begun thinking about the canon of the New Testament, many of the studies have focused on the Gospels, Paul’s letters, or the book of Revelation. Missing in this analysis is sustained attention to the collection of Catholic Epistles (CE). These letters are often considered not only “general” but also generic. At best, they are a catchall category of writings that are “non-Pauline.” In scholarly treatments, they are often “offered up as the leftovers of the NT” (p. 8) when one is finished feasting on the Gospels and Paul. Dissatisfied with this approach to the CE, David Nienhuis and Robert Wall seek to offer an alternative account of the shaping and shape of this section of the New Testament canon. Both teach at Seattle Pacific University and have written extensively on the New Testament canon. Drawing on their previous work, they enter the fray of New Testament canon studies at perhaps its most contested point. The shape of their collection of chapters has three main parts. Part One introduces the nature of canonical collections and outlines the hermeneutical features of their approach (pp. 3-69). Representing the bulk of the book (pp. 71-243), Part Two provides an introduction to each letter in the CE, grouped by author (James, Peter, John, and Jude). Here they sketch the canonical portrait of each author, discuss the reception of each writing, and offer a brief commentary and theological summary of the letter. In Part Three, Wall and Nienhuis adumbrate the “unifying theology” of the CE as a collection (pp. 247-72). A clear contribution of this volume is its treatment of the CE as a coherent literary unit. The “central core” of their study is “the insistence that the Catholic Epistles collection is in fact a canonical collection and not a random grouping of ‘other’ or ‘general’ letters that emerged from communities not founded by the Apostle Paul” (p. xvi). For them, the CE collection represents “the final redactional act of the church’s canon-constructing endeavor” (p. 17). This collection, then, is effectively the “final piece of the canonical puzzle” (p. 17). Rather than being an afterthought, this collection represents the last word of the New Testament. 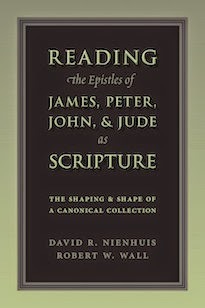 For Nienhuis and Wall, “the CE collection is revealed to be the pièce de résistance that determined the ultimate form of the NT canon” (p. 17). In this regard, it is the “final brushstroke of canonization, without which the masterwork of the NT would have been incomplete” (pp. 17-18). Many assume straightaway that these letters are only “generally” related, but Nienhuis and Wall insist that their juxtaposition in this collection and in relation to the other New Testament groupings yields both literary and theological fruit. They “challenge the critical consensus regarding the theological incoherence of the CE collection” by arguing that “the canonical collection of four witnesses, James, Peter, John, and Jude (“the Pillars of Jerusalem”), be read together as the interpenetrating parts of a coherent theological whole” (p. 10). To present this “unifying theology” of the CE, they utilize Tertullian’s articulation of the Rule of Faith as their rubric (i.e., God, Christ, Community of the Spirit, Discipleship, and Consummation in a New Creation, see pp. 72-73, 100-01). At first this seems like an unnecessary imposition. However, Nienhuis and Wall connect the “canonical logic” of the collection to the theological presentation of the Rule, showing how each of these themes develops across the CE. In this analysis, “themes introduced by James are elaborated by 1 Peter, a witness which is then completed by 2 Peter, even as 2 Peter is linked to 1 John, which is epitomized by 2 John, qualified by 3 John, and concluded by Jude” (p. 250). For them, this logic “apprehends a collection held together like a link of chains” (p. 250). For example, in their presentation of the “shape of the canonical collection,” Nienhuis and Wall consider the role of James as a frontispiece and Jude as a fitting conclusion. They argue that 2 Peter serves as a kind of literary and theological anchor for the entire collection; and they analyze the interrelationship between these letters and the narrative framework of the book of Acts. To give a specific example, they argue that the CE collection complements the Pauline corpus but also guards against misinterpretation of Paul’s major theological assertions (e.g., “justification by faith”). In this way, the CE function “strategically to curb the church’s tendency to read and use Paul’s witness as its canon within a canon” (p. 73). Peter and James, in particular, acknowledge that “Paul’s message is easily misunderstood if it is not framed by the larger biblical witness of prophets and apostles” (p. 145). Nienhuis and Wall do not argue that these letters necessarily correct Paul, but rather that they actually safeguard the “deeper logic of the Pauline gospel” (p. 155). The emphasis in the CE on the need for a faithful life of imitating Christ critically informs Paul’s emphasis on faith in Christ alone for salvation (p. 155; cf. 2 Pet 3:15-16). Having access to both of these collections (“Pauline” and “Pillars”) enables a reader of the New Testament to receive a proper understanding of the gospel. The canonical context, then, “invites a reader’s attentiveness to the constructive (and not adversarial) character of the interplay between these two epistolary collections” (p. 165). This volume also advances the methodological discussion about what a “canonical approach” to the New Testament might look like. Wall and Nienhuis consistently seek to relate the “historical shaping” of the collection (pp. 17-39) to its “final shape” (pp. 40-69). This connection outlines a method that is able to relate how the canon formed to how it functions. Their understanding of canon leads them to focus not on initial composition but on “canonization,” the moment these writings formed collections. This, for them, is the means by which biblical writings function as scripture for later generations of readers (e.g., see p. 11, 33, 41, 48, 97). A community of readers values these letters together as “scripture” because they recognize and affirm their collective “aesthetic quality.” For them, this is a central “criterion for canonicity” (pp. 11-15, 249-50). Readers in the church eventually recognized that the CE collection functioned well together as a unit and thus received and transmitted it as an authoritative set of scriptural writings. As a coherent and interconnected seven-letter collection of writings from the Jerusalem apostles and Jesus’ brothers, the CE helped complete the shape of the New Testament canon as a whole. Any type of canonical analysis is fraught with critical definitional decisions and interpretive assumptions. Some will object to the dismissal of historical-critical consensus, while others will ask whether any of these interpretive insights are still valid if these letters are not seen as late and pseudonymous works. Some will argue that original authorship should remain a controlling factor in exegesis. Still others will want to associate inspiration and canonization more closely with initial composition rather than reception within the community. Further, many will not accept their analysis because they will reject its premise. However, this particular aspect of the volume is part of its value. Nienhuis and Wall outline the methodological issues, provide critically informed rationale for their approach, and then implement it and outline its consequences for the exegesis and theology of these letters. Indeed, they intend their volume to come alongside Brevard Childs’ The Church’s Guide for Reading Paul to form “the basis of a canonical introduction to the NT letters” (p. xv). Accordingly, this volume represents a substantial treatment that will need to be taken into account in further studies of the New Testament canon. Wall and Nienhuis’ work here will aid anyone seeking to construct a canon-conscious interpretation of these rich but sometimes relativized letters. Also in Themelios 39.2 (July 2014): 324-26.